We insulate surfaces for many reasons. The most common include energy savings, personal protection and condensation prevention, along with protecting the environment from greenhouse gases and the deterioration of the ozone layer. Every fall, many people insulate surfaces, primarily pipes, to prevent them from freezing. Much of this insulation is sold through the do-it-yourself centers. Using insulation to save energy or for personal protection is a fairly very straightforward and common sense concept. However, calculating the correct thickness to prevent condensation is a more complicated proposition because additional environmental factors such as relative humidity and wind speed play a major role in selecting the correct thickness. These added environmental variables are often unknown or vary widely. This is also true when it comes to determining the correct thickness to prevent pipes from freezing in cold weather. As we will see, if the temperature is below freezing for an extended period of time, pipes with no water flowing through them will freeze unless a heat tape is applied to compensate for heat loss. Insulation can prolong the time before pipes freeze, but not prevent it in all cases. This paper is divided into two sections. First we will look at the effects variables such as ambient temperature, pipe size, fluid temperature and insulation thickness have on the time it takes for pipes to reach freezing temperatures. Second, we will look at some of the variables used to select the correct heat tape/trace for a given condition. 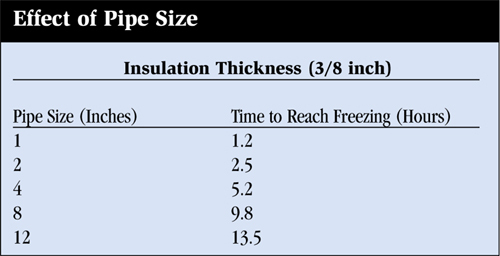 The concept of freeze protection is quite simple-use insulation to maintain the temperature of the fluid in the pipe above the freezing point (32 degrees fahrenheit [F]). Insulation thickness certainly plays a factor in this concept, as increased insulation retards heat flow. Ambient air temperature plays a major role. The lower the ambient temperature (greater temperature differential) the faster heat will be drawn from the residual heat in the fluid in the pipe. Pipe size and fluid temperature play a factor because each effects the amount of residual heat found in the pipe. The charts at top left (figures 1, 2 and 3) show the effects of variables when considering freeze protection. These include ambient temperatures, pipe size and fluid temperature. Other considerations include pipe material and wind speed. Pipe manufactured from PVC provides some added time to freeze because it has a lower k factor than copper. However, there are other factors to be considered when considering PVC versus copper pipe from a material point of view, such as burst strength, and the ability to thaw or repair pipes. Wind speed will tend to slightly decrease the time to reach freezing. The main difficulty in determining the correct thickness to prevent freezing is the time and ambient temperature factors. It’s often difficult to determine how cold an unheated crawl space, attic or outside wall will get when the temperature drops below freezing. Suffice it to say, if the temperature is low enough for a long period of time, the pipes will freeze without added heat input from either fluid movement (running water) or use of a heat tape/trace with sufficient Btu input to compensate for the Btu loss. Using insulation by itself to prevent frozen pipes can be recommended in the "southern frost belt" area of the southeastern United States, where temperatures only drop below freezing for short periods of time during the night, while during the day the pipes will have fluid movement. In the northern regions of the United States, where freezing temperatures set in for prolonged periods of time, it’s recommended that a heat tape/trace be used in conjunction with insulation. When insulating pipes, it’s important to insulate all exposed surfaces, including tees, valves or faucets. Exposed surfaces may cause localized freezing. Flexible closed cell polyethylene or elastomeric insulation are often used for the purpose of insulating plumbing, both residential and commercial. These lines could be found in crawl spaces, walls, attics or piping in parking garages. Fire sprinkler lines are often insulated as well as in unheated warehouses. The closed cell polyethylene is well suited for these types of applications because of its excellent range of properties (low thermal conductivity and water vapor permeability) and ease of installation (no need for additional water vapor barrier). Heat tapes/trace systems have come a long way in the past several years in terms of performance and ease of installation. It’s highly recommended to insulate lines that are heat traced to improve the performance of the heating cables. The first step in selecting a heat trace system is to match the application and the environmental conditions with the correct heating cable power output. Selection guides are available from the manufacturers of the heating cables for this purpose. Criteria that will have a determining factor on the system selected will be pipe location, pipe size, pipe material, minimum expected ambient temperature, temperature at which the pipe is to be maintained, length of run and the type and thickness of applied insulation. Systems are available for freeze protection (above and below ground) along with flow maintenance applications such as grease or fuel lines. The heat loss through the insulation wall must be balanced with the heat gain provided by the heat trace tape. This balance will prevent the system temperature from escalating above the recommended use temperature for the insulation. Depending on the application, you may choose a standard outer jacket on the heating cables or a more chemical resistant jacket for industrial applications. The heating cable length depends on the length of the run and the additional footage that may be needed to protect valves, flanges and pipe supports. These areas of high heat loss may require additional footage. In addition, extra cable will be needed for power connections, tees and end seals. For added power output, higher voltage lines or additional cable strips may be run together. Again, the concept is to balance the heat input with the heat loss, and the type and amount of insulation used will effect this calculation. Typical heat trace tape wattages (per lineal foot) are typically available in 3, 5, 8 and 10 Watt products where 1 Watt = 3.412 Btu/hr. Cables are designed for easy connections. Most heating cables are now self regulating in terms of temperature control that varies its power output to respond to temperature all along its length. This allows the cable to be cut to length in the field and it saves energy. Heating cable systems can be controlled either manually, by thermostatic control or self-regulating. All heating cables should be Underwriters Laboratory (UL) Listed, Canadian Standards Approval (CSA) certified, or Factory Mutual (FM) approved for their use. The most common thickness for heat trace tape is 1/4 inch, and will require that the insulation inside diameter is sized properly to fit over both the pipe and the tape. If this isn’t taken into consideration, the longitudinal seam could experience excessive stress. Normally, because of insulation’s flexibility, no adverse effects are to be expected. Application of insulation will provide protection to pipes from freezing under short term cold conditions. For longer-term conditions, the use of a heat trace cable system is recommended in conjunction with insulation. Flexible closed cell insulation based on polyethylene resin is often used for this purpose because of its performance properties and ease of installation. The use of an insulated heat cable system provides a simple and reliable method to prevent frozen pipes in even the most severe conditions. Today’s heating cable systems have a number of benefits. They have the ability to be overlapped, and there’s no need for a thermostat. Also, they’re designed for energy savings and to eliminate overheating or burnouts.